Ackroyd Drive London E3. With Louis Masai, Human Nature Art and Tower Hamlets Cemetery Park. 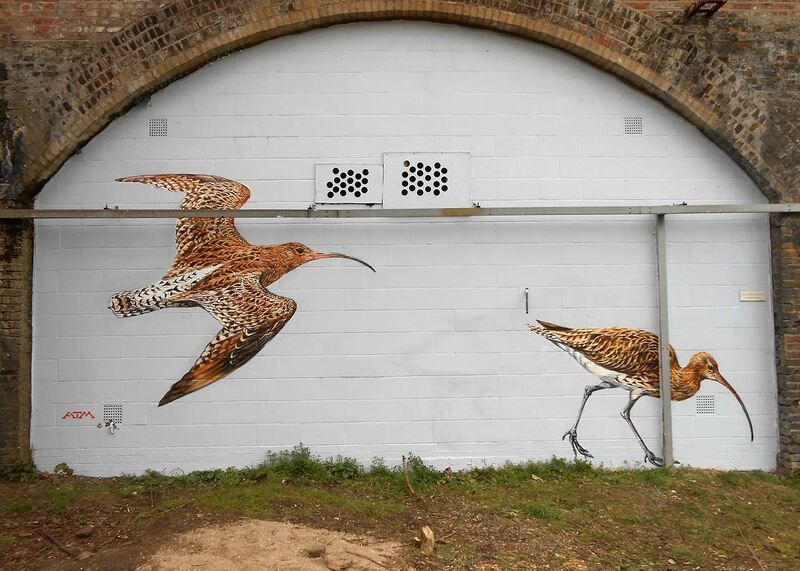 I painted these beautiful elegant birds at endangered13, on an urban wall, because I want to communicate their value to others and help inspire a change in the way we treat the land. Our farming practices don’t have to be so draconian that they eliminate almost every other species. Though once a very common British bird, curlew are suddenly one of our fastest declining, now on the IUCN Red List,along with other much-loved species like the puffin and nightingale. The curlew embodies the wild, bracing air of the hills and moors, its magical call resonating around the valleys and bogs, infusing the peatlands, wild grasses and open sky with its presence. I only wish I could paint this haunting, majestic call so that people who have never heard it before could experience the thrill. Curlews have declined 50% throughout the UK in the last 20 years, but an astonishing 80% in Wales and Ireland. In winter there is a huge influx from Scandinavia that makes the UK the most important country for curlew in the world. They are emblematic of a real crisis in how we treat the land: agricultural intensification, habitat fragmentation, drainage of lowland bogs and meadows, grazing pressure and nest trampling by livestock, and estuary development for leisure activities is speeding their decline. They are a perfect example of a species that could recover if we curbed some of our more destructive practices.